If you were to make my mistake of going up to the West End to buy a pillowcase and, as a consequence, have the entire grief of the world descend upon you in Oxford St, then I can recommend no better antidote than a trip to the St John Hotel in Leicester Sq where from 3pm each day you can enjoy a bun moment. It was a welcome relief from the madness of the crowds, just taking refuge in the calm of this gleaming white hotel which opened a year ago as the Chinatown outpost of the familiar St John restaurants situated in Smithfield and Spitalfields. As Therese set to work caramelising sugar in a pan and then adding Verona chocolate and cream to make a ganache, she took extra care to darken the caramel first. “Fergus always wants ‘more, more intensity of flavour,’” she confided,“and the dark caramel emphasises the rich bitterness of the chocolate.” Next, as she set about the more routine task of cutting up the proved dough into small pieces and rolling them into perfect round buns, arranged neatly on grease proof paper ready for egg glazing and baking, Therese talked of future plans for breakfast buns including a bap using bacon which they cure themselves. And it was revealed that all the chefs love pork buns from a nearby outlet in Chinatown, an influence readily acknowledged in the conception of the St John buns. At 3pm, I had the luxury of the quiet upper barroom at the St John Hotel to myself, looking down on the noisy roadworks below through the double glazed panes. 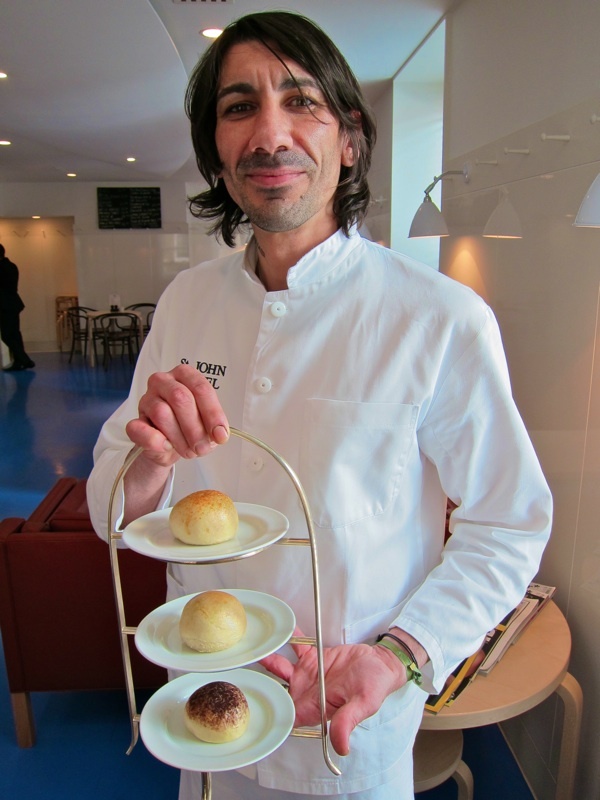 Then barman Riccardo Ilbello came striding up with three buns upon a tiered stand, presenting them with a subtle flourish and leaving me to my private pleasure. This was the moment I had been waiting for, and it was my bun moment. 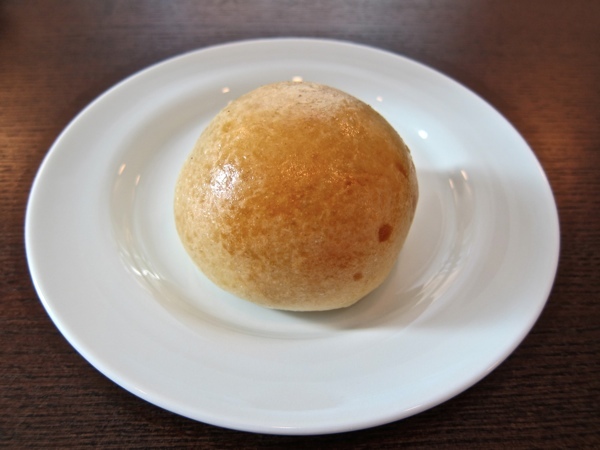 Starting at the top, I reached for the anchovy bun, biting through the pleasantly spongy dough to reach the characteristic salty tang of the anchovy paste. Just one bite and half my bun had gone, giving me pause, lest the fleeting moment vanish before I had fully savoured it, so – leaping ahead – I reached for the second bun which was filled with prunes that had been soaked in Earl Grey for months, providing a fruity contrast to the fishy paste. 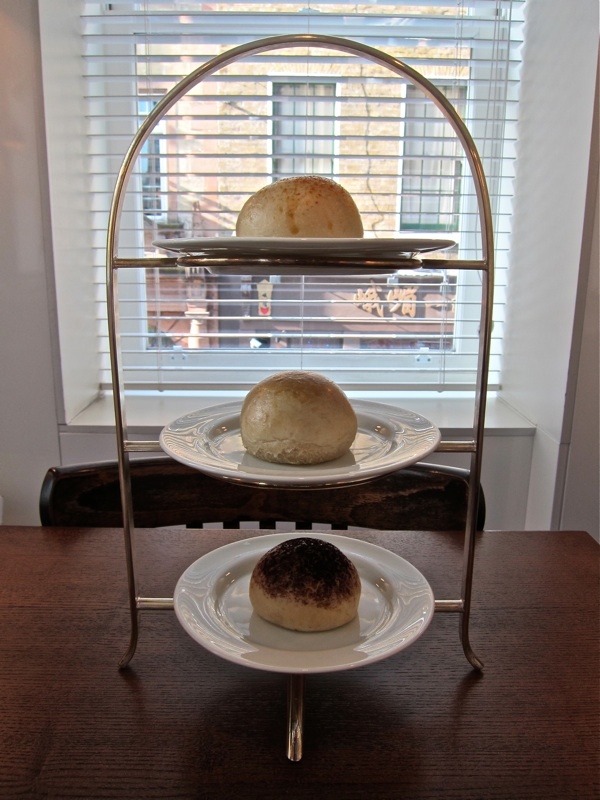 Returning to the anchovy bun and the taking another bite of the prune bun, I found that two out of my three buns had gone – and, even as I sat enjoying the rich aftertaste, my moment was flying away. Thankfully Riccardo arrived, like a spirit to still the passage of time, bearing a glass of orangey – a scotch with an essence of Nabilo oranges from Ceylon. It was, he suggested, the perfect complement to the chocolate bun. Yet I decided the give the bun a chance to perform solo first, reaching out and biting into it, and thereby releasing an inordinate amount of the ganache with its deep deep chocolate creaminess and tangy bitter aftertaste of caramel. Now I took a sip of the orangey, which picked up all the flavour of chocolate in my mouth to delicious effect. And then the moment was over. As evidence, the cake stand was bare and I drank my tea afresh, the lightness of its taste renewed by contrast with what came before. Everyone has their moment, I have been told. 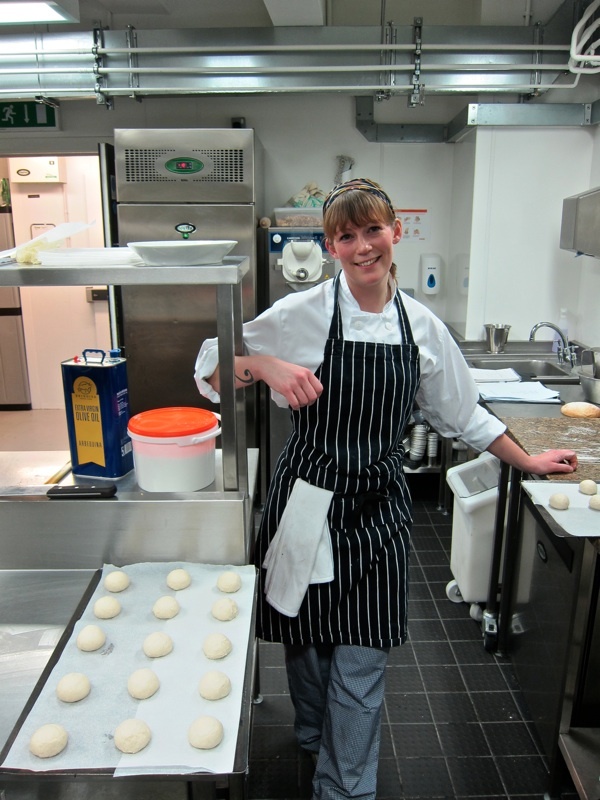 But the beauty of the bun moment at St John is that – in exception to the common experience of life – you can go back and enjoy this moment as often as you please. 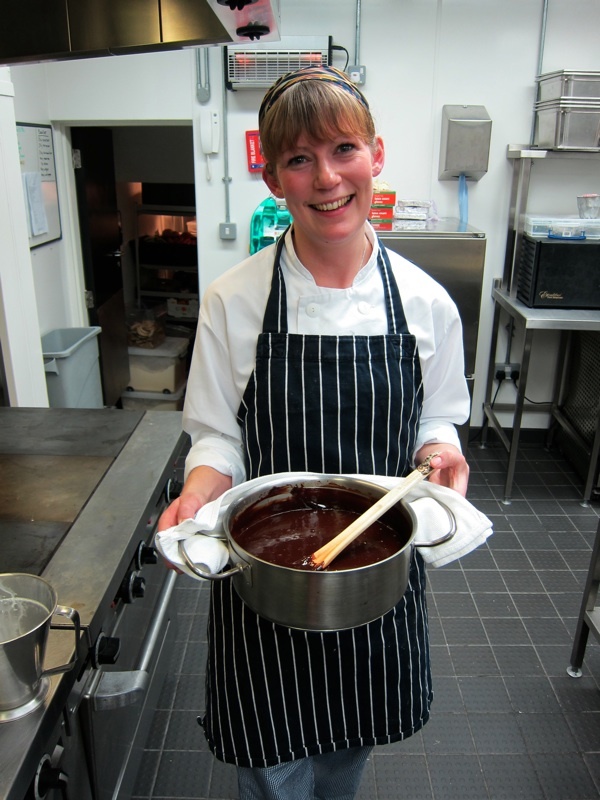 Therese Gustafsson with her pan of chocolate ganache. 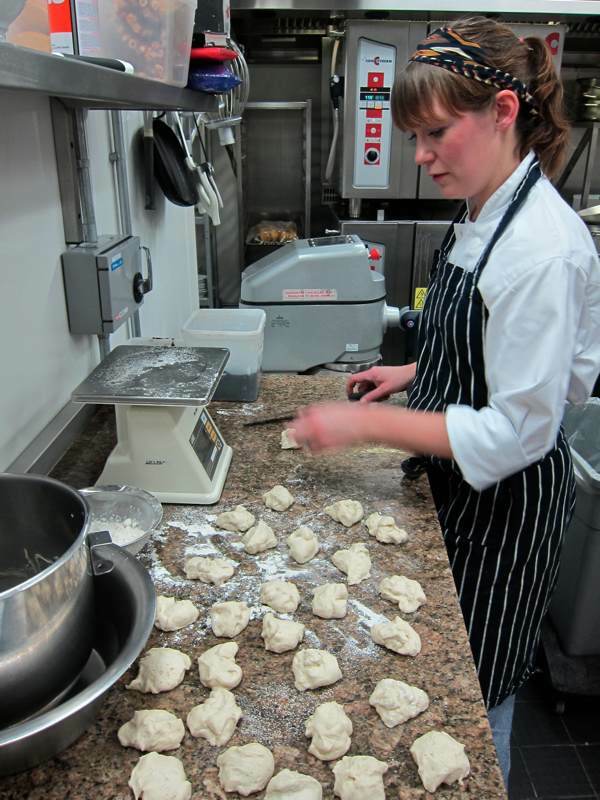 Therese divides up the dough into bun-sized pieces. 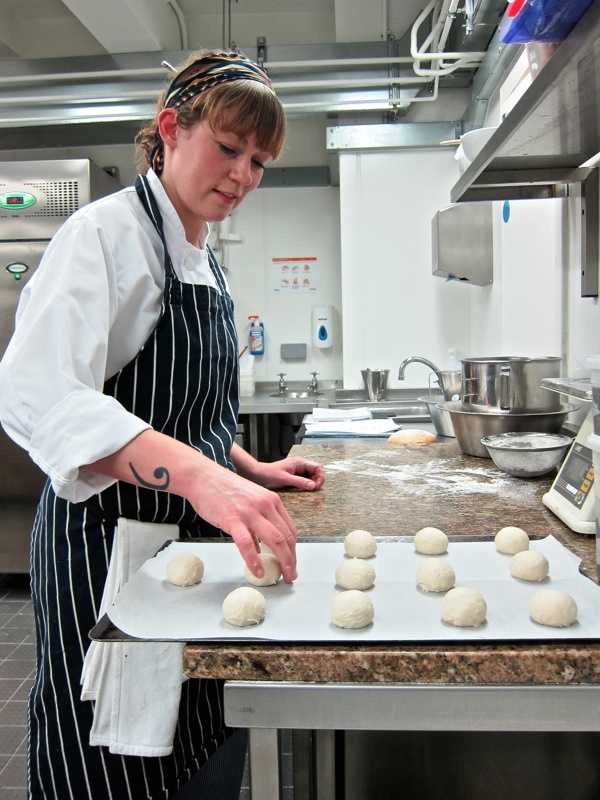 After rolling, Therese places the perfectly shaped buns on a baking tray. The buns are ready for the oven. 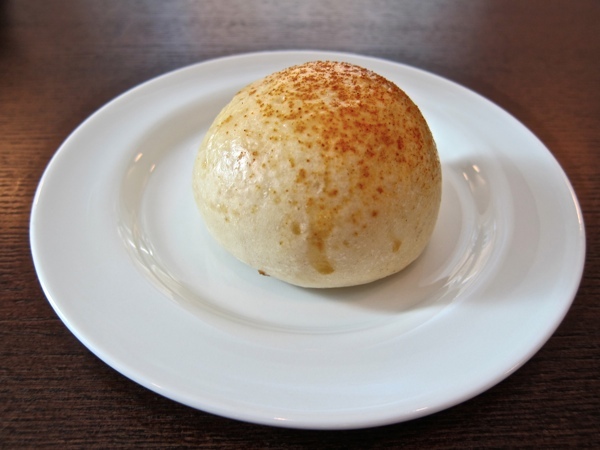 Anchovy paste bun sprinkled with paprika. Prune bun with egg glaze. 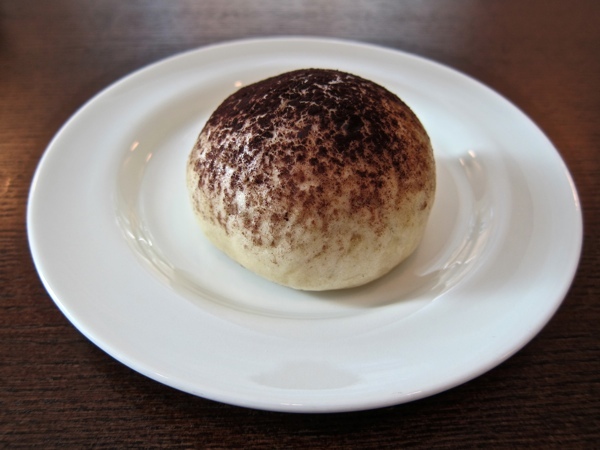 Chocolate ganache bun sprinkled with chocolate powder. 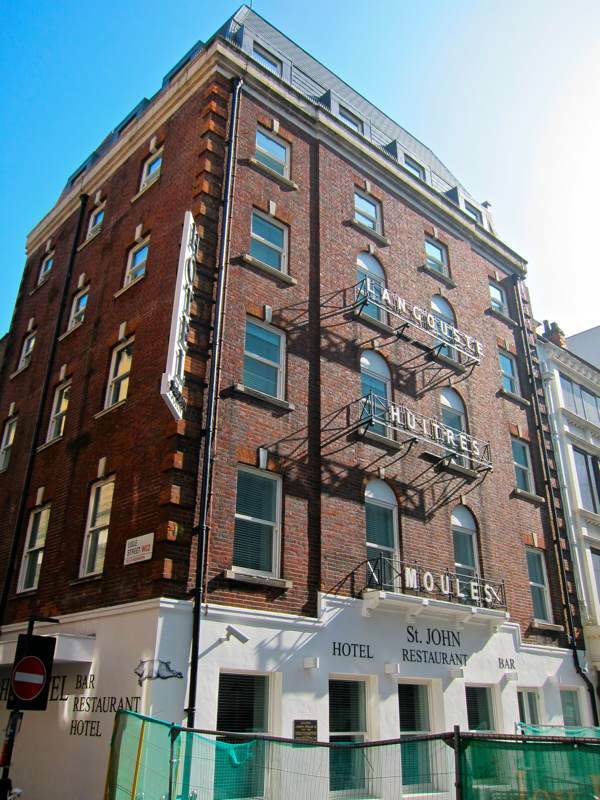 St John Hotel is on the corner of Lisle St, between Chinatown and Leicester Sq. OK, this is just cruel. These look and sound so delicious – especially the anchovy one. The weetabix I am eating as I read this might just as well be gruel. Wonderful. A lovely afternoon treat if you’re forced into town on a day off. They used to do lovely ‘Breakfast Buns’ too. Very different to the afternoon version, these are flaky suety buns somewhere between a croissant and a brioche (3 varieties: butter, spice & jam). Not sure they are still on the menu but worth popping in and asking if you happen to walk by before 11! Ahhhh. Reading your posts can be like bun moments in themselves. The book arrived. And was promptly snaffled by another. Testament to its interestingness, I’m sure.